Kids in grades 4 - 8 are invited to learn to spread happiness, smiles, magic, and a bit of mischief by committing acts of ninja kindness! 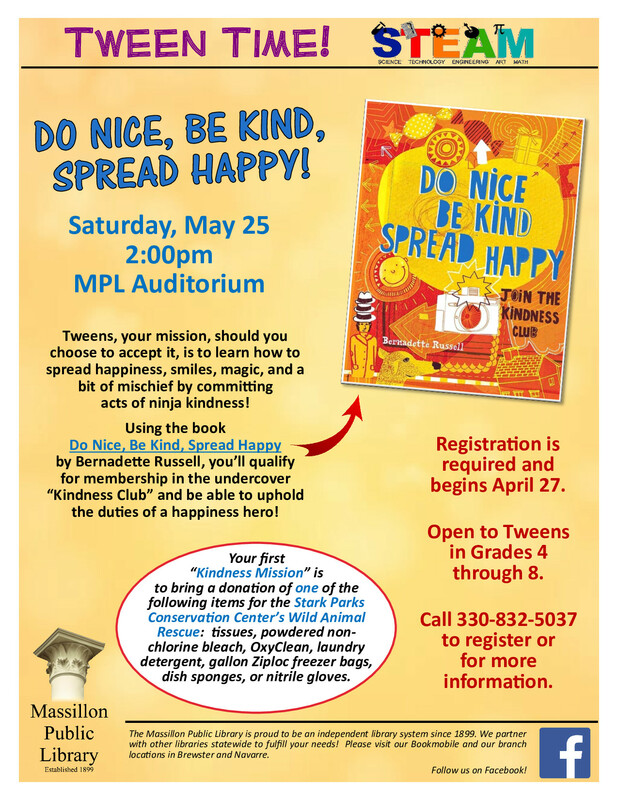 Using the book Do Nice, Be Kind, Spread Happy by Bernadette Russell, you’ll qualify for membership in the undercover “Kindness Club” and be able to uphold the duties of a happiness hero. Your first “Kindness Mission” is to bring a donation of one of the following items for the Stark Parks Conservation Center’s Wild Animal Rescue: tissues, powdered non-chlorine bleach, OxyClean, laundry detergent, gallon Ziploc freezer bags, dish sponges, or nitrile gloves. Registration is required for this free program and will begin on April 27. For more information, or to register, contact the Children's Department at 330-832-5037.